The worlds best selling residential and light commercial rotor designed for use in large turf areas, Sets the standards for the entire industry. Keeps dirt out, won’t fall off. 12 standard or optional extra 7 low-angle nozzles. For fast, hassle–free adjustment, wet or dry. First introduced over 20 years ago and still continuously improved. Keeps rotor speed consistent regardless of nozzle size or pressure. Puts an end to nozzle clogging. Add the optional drain check valve to any PGP sprinkler. It prevents water from draining out of the irrigation pipes when the sprinkler pops down. Checking up to 3.0m in elevation change, it saves water, reduces the liability exposure and stops erosion near the sprinkler. The SRM is Hunter’s shortest-range rotor, and was designed to offer a convenient and efficient alternative to spray heads. It is capable of working in tandem with larger rotors to combine big and small areas in a single zone. Utilizing the SRM where appropriate results in fewer sprinklers performing more efficient work at a more economical price. The SRM features a rack of six water-efficient nozzles—all of which can be easily identified by its flow rates and installed and changed quickly and easily. This versatile rotor also includes a radius adjustment feature that fine-tunes the spray to keep water off driveways, walks, and other non-landscaped surfaces. A rack of easy-to-install-and-change, water-efficient nozzles…just like PGP. Easy adjustment from the top of the sprinkler…just like PGP. The safety and durability of a rubber cover…just like PGP. 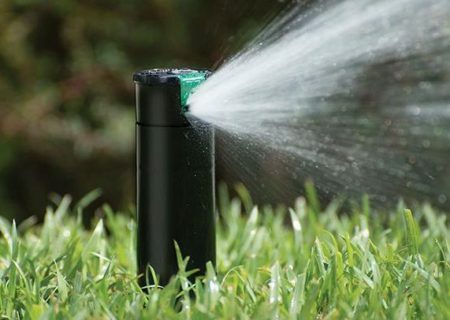 The PGJ is a chip off the ol’ block, in essence a PGP “junior.” Hunter has scaled down the world’s top-selling sprinkler exclusively for use in applications that typically call for a spray but where it’s now possible to have all the benefits of a rotor. The PGJ is capable of working in tandem with larger rotors to combine big and small areas in a single zone, offering a convenience and efficiency that sprays do not. With PGJ, fewer heads perform more efficient work for a more economical price. 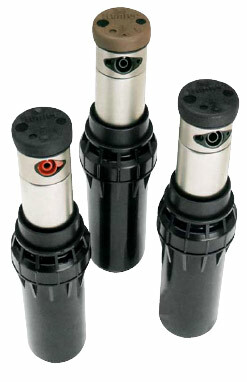 Easily adjustable from top of sprinkler, up, down, wet or dry. Time proven, reliable rotation, year after year. Keeps rotation speed consistent regardless of nozzle size or pressure. Traps more debris without clogging. Prevents wet spots caused by low head drainage. With 34 nozzle choices, a 17’ to 46’ radius, and 6 body choices, the I-20 is an indispensable rotor. Whether you’ve got a small area, sandy soil, or a mix of shrubs and grass, the I-20 is ready to water with efficiency and reliability. Recent improvements include automatic arc return; non-reversing 360, from 50 to 360 degrees; and a non-strippable, vandal-proof drive mechanism that prevents gear stripping and saves repair costs. Adding FloStop® control, easy through-the-top arc adjustment, and a standard drain-check valve all equate to a rotor that stands second-to-none in its class. The I-25 gets the job done with power, efficiency, and commercial-grade reliability. With a robust watering radius of 40’ to 71’, this rotor can be used in a variety of applications and environments. Its compact, highly durable design comes with an optional stainless steel riser for tough-as-nails strength. With a 5-year warranty, the I-25 also has options for reclaimed water ID and high-speed. A standard check valve is built in, and a wide selection of high performance nozzles are available. Efficient, tough, and built-to-last, Hunter’s I-25 rotors work hard day in and day out so you don’t have to. With the ability to deliver water accurately and efficiently at distances up to 22 metres, our topof- the-line commercial rotor has earnedthe distinction of being the number one choice at sports facilities the world over. The I-41 is also a proven performer at parks and commercial sites as well. It’s no wonder why with features like the ProTech™ safety system, two secondary nozzles that offer exceptional mid-range and close-in coverage, a stainless steel riser, the factory installed drain check valve, and a new self-adjusting variable stator that enhances the life of the gear drive. Small exposed heavy duty rubber cover and boot keeps playing areas safe. Uniform coverage 13.7 – 22.6m radius. Dual opposing nozzle full-circle option. Superior coverage for maximum efficiency. Up, down, wet or dry with through the top convenience. Stainless steel riser and super–strong spring. Time–tested and now improved for even longer life. Patented VStat® Self Adjusting Stator. 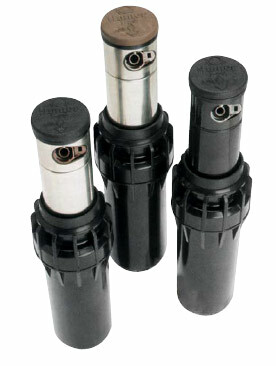 No stator ring required, drives with more power and adds years to sprinkler life. Drain Check valve for up to 4.6m elevation change. The I-90 is the industry’s longest distance rotary sprinkler specifically designed for parks, sports fields and public areas. With a radius of up to 29 metres from a single sprinkler. Yet its reduced-size diameter and cushioned rubber cover make it the perfect choice for parks and wide-open lawn areas, as well as perimeter watering of athletic fields and horse arenas. The I-90 is easy to service, with a jar-top body cap that allows quick access to the filter screen and check valve with no extra pieces, parts or tool required. The I-90 is offered in two models – a full-circle opposing-nozzle version or an adjustable arc model – each with colour coded nozzles that can be field-changed to match the specific needs of your site. Helps keep playing surfaces safe. Truly uniform coverage and fast identification. 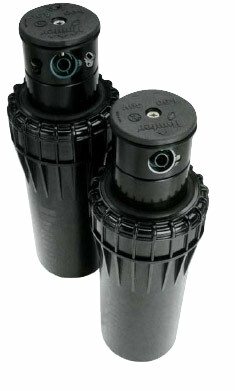 Easy access to screen, gear drive and valve assemblies. Closed case rotor: Absolute protection from dirt. Clean flushing action and positive retraction. Assures positive retraction, time after time. 5 year over counter warranty.